Various touches of 100 changes on the unmuffled bells at 12:30pm. Ringers 3 to 6 also rang on the half-muffled bells at 9:30am for the Service and rang lots of Plain Hunt Whole Pull on 4. 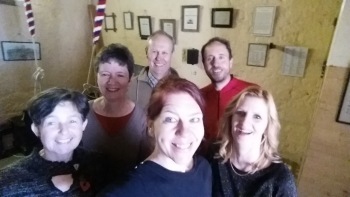 Ringers at Upper Cam for the 12:30pm celebrations. Last updated Monday, 12 November 2018 at 09:34:32. First submitted Monday, 12 November 2018 at 09:28:53 by Alex Reeves. Sent for publication in The Ringing World on Friday, 16 November 2018 at 23:03:03. This performance has been viewed 178 times.